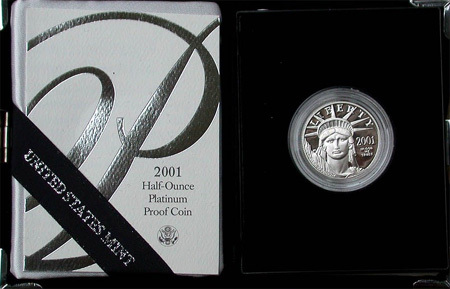 The 2001 Platinum Eagle was available throughout the year in bullion format and offered in proof format for collectors starting on May 30, 2011. Keeping with the format of the series, the bullion coins carried the static reverse design featuring a soaring bald eagle, while the proof coins featured a new annually rotating reverse design. Sales of the bullion coins were mixed compared to the previous year. Increased numbers were seen for the 1 ounce, 1/4 ounce, and 1/10 ounce sizes, while the 1/2 ounce size showed a decline. These coins were sold by the US Mint through a network of authorized purchasers who distributed them to the broader market. The collector coins continued the “Vistas of Liberty” design series featuring the bald eagle in landscapes across America. The 2001 Proof Platinum Eagle depicted the eagle in the southwestern desert with saguaro cacti, with the inscriptions in a blend of incuse and relief techniques. The reverse was designed by Thomas D. Rodgers and paired with the John Mercanti rendition of the Statue of Liberty on the obverse. Both the pricing and maximum mintage levels for the proof coins remained the same as the previous year. All coins were packaged in black velvet packaging and accompanied by a certificate of authenticity. After beginning the year above the $600 per ounce, level, the price of platinum experienced a decline in the second half of the year with the price dipping as low as $400 per ounce. The average price of platinum throughout the entire year was $529.04.